Brentwood High School senior Sophia Rivera made International Association of Athletics Federations (IAAF) history by becoming the first athlete at any level to compete in two field events simultaneously at a world championship, according to her mother, Michelle Hassemer, on Facebook. “And she did it with style, finishing eighth in javelin and bringing home the SILVER MEDAL in shot put home to the USA! Congratulations!” Hassemer reported. The shot put and javelin finals at the IAAF World Youth Championships, on Thursday, started within five minutes of each other in Cali, Columbia. Brentwood High School senior, and National Scholastic Athletics Foundation (NSAF) javelin thrower Sophia Rivera has announced she will compete in both the shot put and javelin finals at the International Association of Athletics Federations (IAAF) World Youth Championships on Thursday, scheduled to start within five minutes of each other in Cali, Columbia, NSAF reports. Rivera is the first at any level of IAAF championship competition to attempt two field events simultaneously, IAAF officials have said. “I look at it as an adventure,” Rivera told the NSAF. She also threw the shot and javelin together at this year’s Kansas Relays. According to the NSAF, Rivera led the nation in shot put for both indoors and outdoors this year. Brentwood junior shot-putter and discus thrower Sophia Rivera again stunned the field Saturday in Jefferson City at the Class 2 state meet. For the third year in a row she won both events. Rivera won discus with a throw of 154 feet, 9 inches, besting her winning throw last year of 129-11. She won shot put with a new overall state record of 51 feet, 1.25 inches. All six of her throws would have broken the old mark. Brentwood High School junior Sophia Rivera won gold at the Kansas Relays with school records in the shot put and javelin, her mother Michelle Hassemer reported on Facebook. The Kansas Relays has attracted track and field athletes from across the United States since 1923. 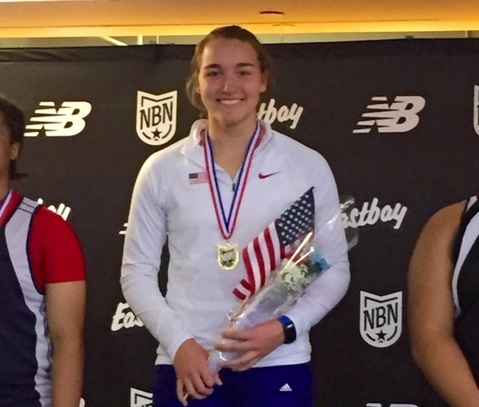 Last month Rivera won the girls shot put at the New Balance Nationals Indoor Track and Field Championships in New York City. 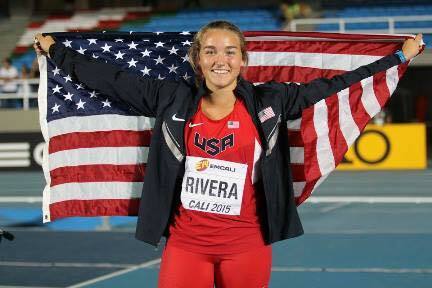 Rivera won Class 2 state titles in the shot put and discus as a freshman and sophomore. Brentwood junior Sophia Rivera has competed in track and field since middle school, and in December threw a best in the US shot put—high school girls so far this indoor season—with a 48 feet, 2 3/4 inches throw at the Throwing and Growing competition at the YMCA’s Youth and Family Center in St. Louis. The throw was a PR (personal record) for Rivera by almost a foot. See a video of her throw below. Rivera had a good summer throwing, according to her mother, Michelle Hassemer. Brentwood sophomore Sophia Rivera, after setting school records in discus and shot put as a freshman, has wasted no time besting her previous records, and more. In December Brentwood sophomore Sophia Rivera attended the Kultan Kiehas Javelin Camp and was selected to be a part of an elite javelin development program involving year-round training as well as sponsored attendance at javelin camps in the United States as well as a trip to Finland this summer to train and compete. Javelin is very big in Finland. Saturday was her first outdoor track meet of the season, according to her mother, Michelle Hassemer. The Riveras were on spring break in Orlando, so they entered her in a meet at Disney’s Wide World of Sports. Brentwood sophomore, Sophia Rivera, 2013 Class 2 state shot and discus champ, received big recognition as a javelin thrower in December, according to the National Scholastic Athletics Foundation (NSAF). Rivera took part in the Kultan Keihas Project Javelin clinic in Chapel Hill, NC, and so impressed the coaches that she was invited to join the full, year-round program, which includes a summer training trip to Finland, a country where where javelin throwing is loved. The program develops young javelin throwers who have potential for success at national and international levels. Before the camp Rivera’s best throw was 117 feet. After a coaching session she was throwing in the 130’ – 140’ range.